Adaptive Display, what’s in the game? And do we need to fine-tune? 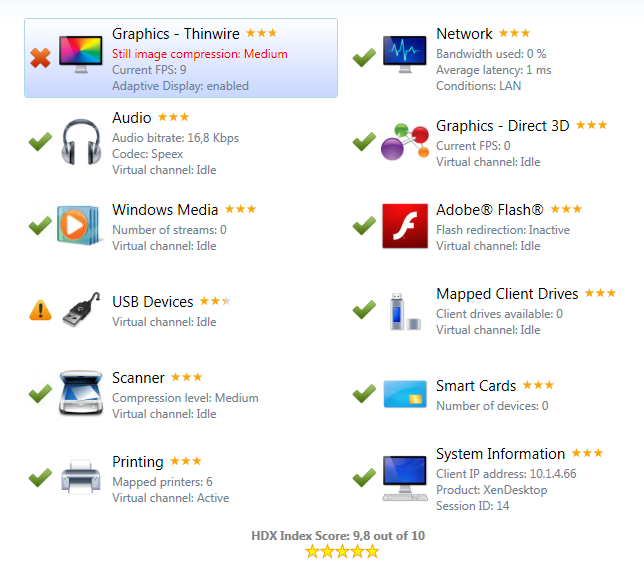 In this blog post I wanted to talk about Adaptive Display, this new HDX feature is now available in both XenDesktop 5.5\5.6 and XenApp 6.5 (through a hotfix), Adaptive Display is the successor of the highly successful Progressive Display SpeedScreen technology, and it’s switched on by default. It’s an awesome technology because it is auto adopting to changes in the available bandwidth. Ok that’s fine by me, so we do not have to create complex policies anymore for LAN and WAN use cases, because it will detect the available bandwidth and adjusts accordingly. Super! But what is exactly going on inside the Thinwire channel? * Note: At this time, not all Adaptive Display policies can be configured using the XenApp 6.5 AppCenter console. Use Windows Group Policy Editor (gpedit.msc) instead. Ok so now we know what settings are in the game of Adaptive Display, how are this settings come together? To make this more clear I made some drawings and explanations. Ok moving on to the Minimum Image Quality setting, this setting sets the JPEG quality floor. Notice that the default Lossy Compression level is set to Medium and the threshold to enable Lossy compression is set to 2147483647 KBps (unlimited), which means that this setting is always on. Ok now we know what the default settings are and how the frame rate and compression is dynamically adjusted by Adaptive Display. So what about this default settings, should we change it or leave it alone? As usual it depends on the use case 🙂 but read on…. Error : Image compression is not tuned to the available bandwidth. An Administrator can improve the user experience by creating a policy that optimizes image compression. This is not the best experience you can get with LAN conditions. The default settings also improves the performance on the LAN when viewing high resolution photos etc, if you enabled Progressive display in the past your users might already be used to this compression level. 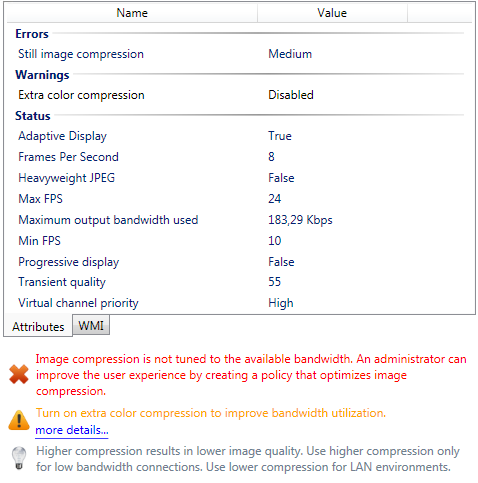 As you can see the Lossy Compression will be turned off when the maximum threshold is reached, for example you can set this threshold on 75% of your LAN speed. The side effect of this one, is that you don’t have any Lossy Compression at all when the Bandwidth is above the maximum Threshold. This can be negatively impact your environment with a lot of LAN users viewing high resolution photos. If we want to improve the user experience on the LAN, we can also lower the Lossy Compression to the lowest level. This looks like this. Keep in mind that Adaptive Display will try to maintain this starting JPEG Quality also for your WAN users. This one is a little bit the same as we configured for Progressive Display in the past. Make a policy which applies a low level of Lossy compression for you LAN users and filter them on internal IP ranges and give it a higher priority then your default policy. You can let the default policy (which applies to all users) default or change it with higher compression levels. In this scenario we only give the LAN users a higher starting JPEG quality. Do we need to fine-tune Adaptive Display? – Do your users need to see lossless images on the LAN? – Is your environment (Network, Servers, Client Devices) fast and scalable enough? I also think the default Out-of-the-Box configuration is fine for most environments, but as you can see there are possibilities to change the default behavoir of Adaptive Display slightly to fit your needs. You can do this by changing the compression levels and telling Adaptive Display what’s the starting JPEG Quality and the Minimum acceptable JPEG Quality. What do you think? Please leave a comment on your thoughts.